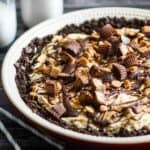 This Almost No-Bake Chocolate Peanut Butter Pie has it all: cool and creamy peanut butter filling, a sweet chocolate graham cracker shell, and crunchy toppings! 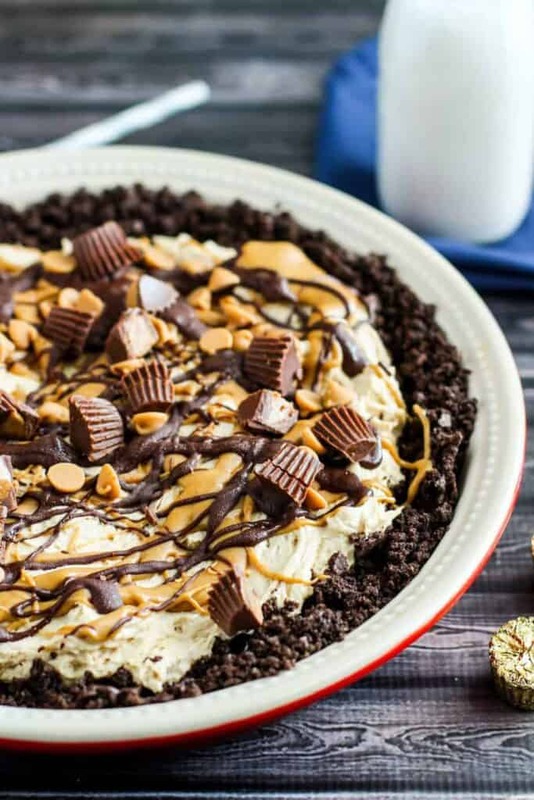 We can all agree that chocolate and peanut butter are flavor soulmates, right? I’d be hard pressed to identify a more complementary flavor duo. And I bet you would be, too. 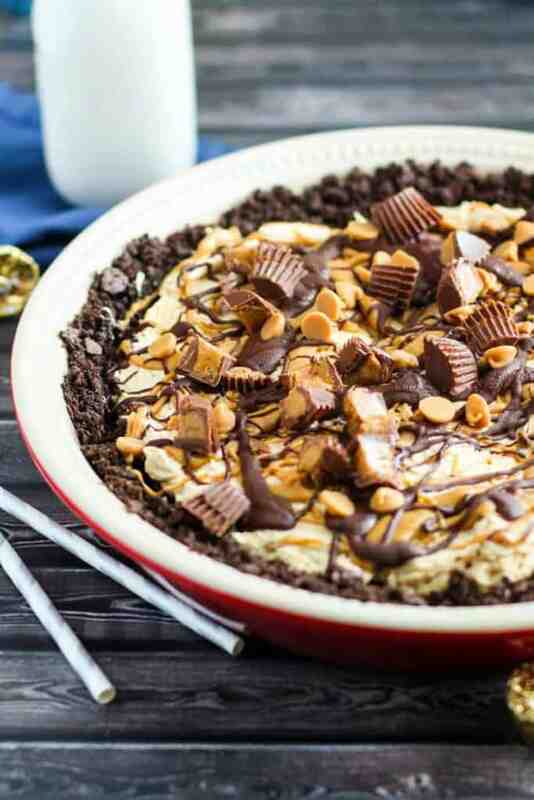 Chocolate and peanut butter come together in this cool, frozen pie. It’s fast and easy enough to make on short notice. Plus it requires almost no baking. Just pop the crust into the oven for ~12 minutes, and the rest is just mixing, freezing, drizzling, and you’re done! But also! Pi Day is nearly upon us! You know, pi = 3.14 … March 14th … 3/14. Not that I really need much of an excuse to make pie… but I made this in celebration of the day. May your Pi Day be filled with this and other tasty, tasty pies. The recipe for this pie comes from Handle the Heat. Preheat the oven to 325 degrees F. In the bowl of a food processor, pulse the graham crackers and sugar until finely ground. Add the butter and pulse until moistened. Alternately, put the graham crackers in a large zip top bag and pulverize them with a rolling pin. Pour the crumbs into a bowl, add the melted butter, and mix until combined. Press the graham cracker crumb mixture into the bottom and up the sides of a 9-inch pie plate. Bake for about 12 minutes, or until fragrant. Cool the crust completely on a wire rack. 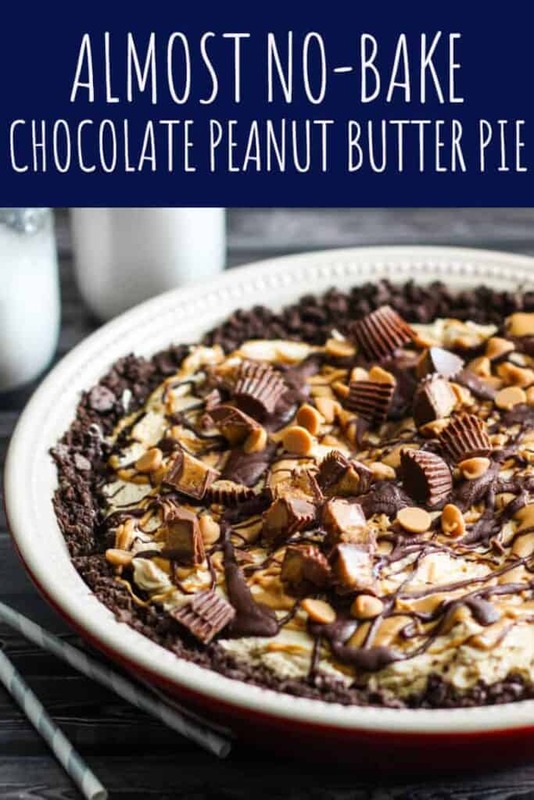 In a large bowl, use an electric hand mixer to beat the cream cheese, 3/4 cup powdered sugar, and peanut butter until it is light and fluffy. In a separate bowl, use an electric hand mixer to whip the heavy cream until thick and light. Add the remaining 2 tablespoons of powdered sugar and vanilla extract and continue to whip until stiff peaks form. Gently fold the whipped cream into the peanut butter/cream cheese mixture. Pour it into the prepared pie shell and freeze for 3 hours. 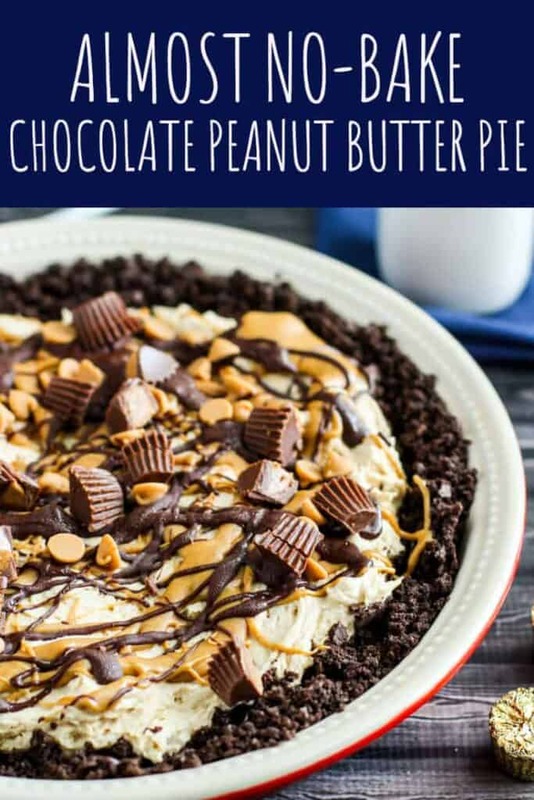 Drizzle the top with melted peanut butter and melted chocolate. 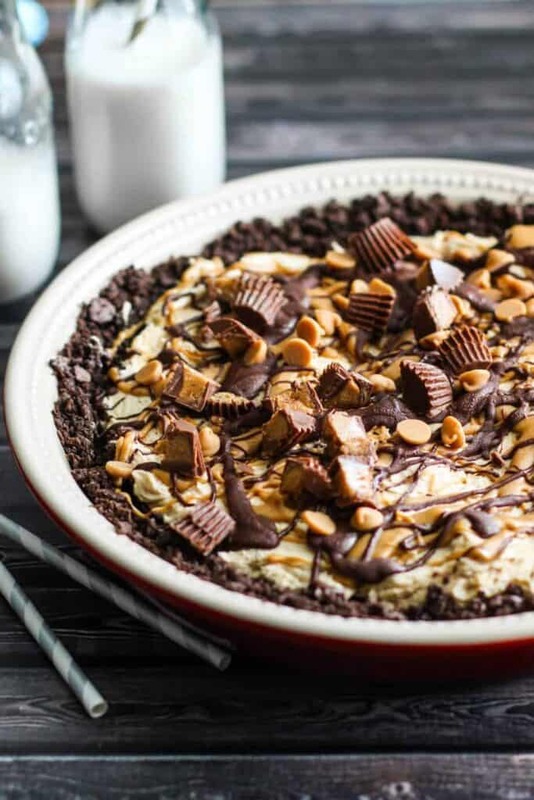 Top with chopped mini Reese’s cups and peanut butter chips. Serve frozen or refrigerated. 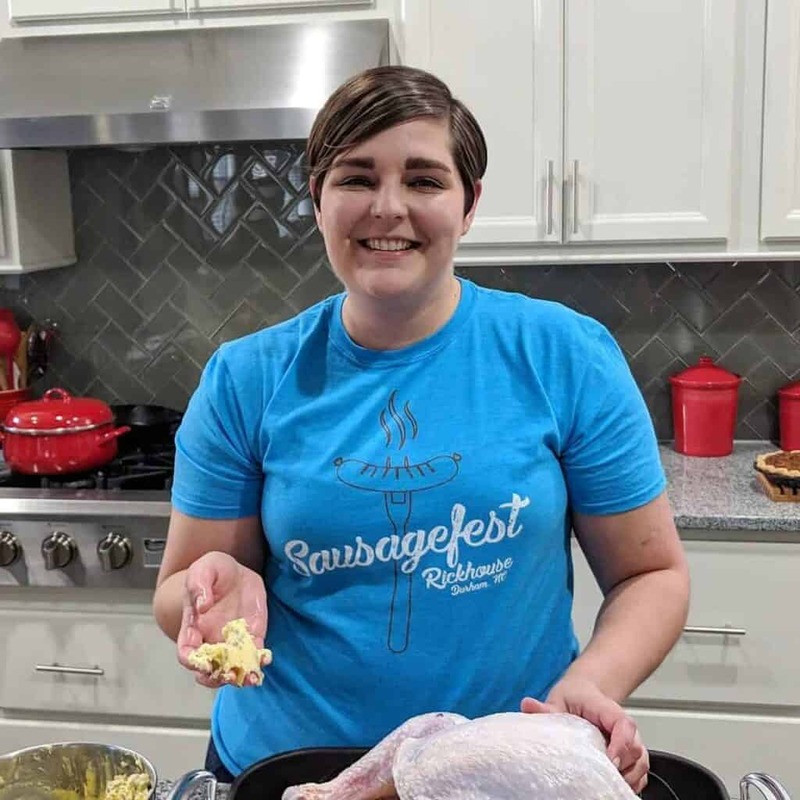 Looking for more pies? Go sweet with Key Lime Pie or Peanut Butter and Chocolate Fudge Pie. Or maybe go savory and handheld with Butternut Squash, Kale, and Feta Hand Pies.